The menu at the left shows several time periods and the main events within each one. Roll over any time period and click on any topic or sub-topic to go to the appropriate page. Scroll and click through illustrated timelines below to explore your chosen time period. There are clickable areas on each timeline that will take you to the associated page. This was the first digital, multimedia history of Canada. It started out as a laserdisc in 1993 and the CD-ROM version has been used in schools across the country. This online, public domain site is the fifth edition of the project. 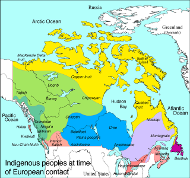 Indigenous Peoples map high-definition custom colour print showing various First Nations at the time of European contact. Suitable for classroom wall display. 71 cm x 71 cm (28 inches x 28 inches). Contact us to order. $179.50 includes taxes and shipping by regular Canada Post. This is an enlarged print of the map from the Indigenous Peoples chapter found here. This was the first successful invasion of Nazi-occupied Europe. Canadians played a key role in taking the strategic island of Sicily. For video and more information go here. A précis of Canada's early economic history in two lively film clips. For a brief history of Canada's economic relationship with the United States: click here for Part 1 and click here for Part 2; total length 14 minutes. This is an excerpt from the feature documentary, Hoodwinked: The Myth of Free Trade, produced by West/Dunn Productions and edited by Bill Dunn. 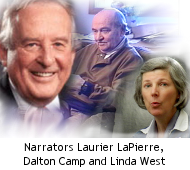 Broadcaster and author Laurier LaPierre narrates after a short intro by Linda West and a guest appearance from Canadian political commentator Dalton Camp.